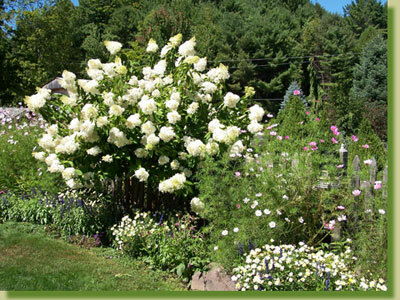 Despite modern garden design in many local gardens, there is no escaping the fact that old-fashioned, Victorian-era gardens are popular with many people. After all, when "tourists" started coming to the Catskills mountaintop late in the 19th century, they spent their seasons in the midst of beautiful gardens. We have installed many. Old-fashioned gardens are as rewarding as they are delightful to look at and enjoy. 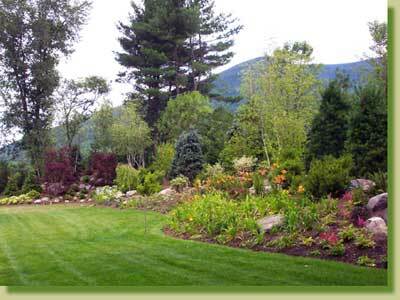 Visit some of the landscaping pages on our site to get ideas and visit us to discuss your plans. Go to other Kerns Landscaping Features: our Hilltop project, a Hillside project, our work at the Boyle and Manuel houses, new pages showcasing our exciting projects on the Bruno house, the Ciampa house and a new Project Sampler highlighting several different landscapes. Kerns Nursery Gift certificates: we are happy to accept orders by phone and e-mail. We will acknowledge your orders will send out Gift Certificates. Many people on the Catskills Mountaintop have used Kerns Nursery Gift Certificates as perfect gifts for family and friends. Visit the Pat Kerns Jewelry - unique, hand-made, one-of-a-kind jewelry that we sell here at Jewett. When we are open, we welcome you to tour our many display gardens from Mother’s Day through the Fall. Picnicking is allowed. Comments about the website ? Questions about our business ?